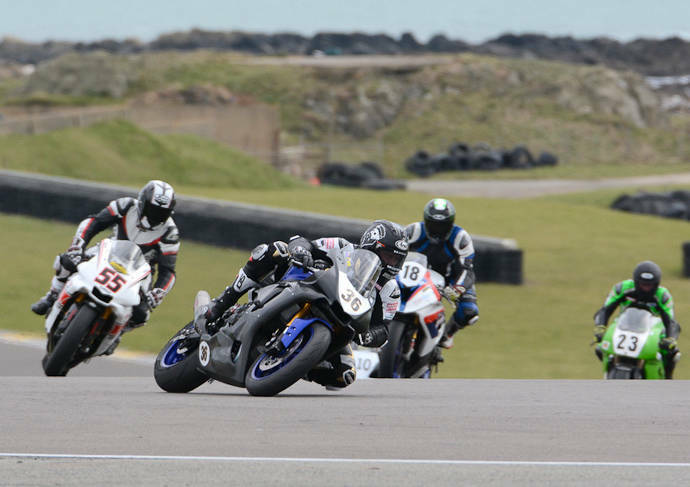 The Wirral Hundred club is synonymous with early season race meetings at Anglesey and the one-day meeting on 24th March saw dry and bright but cold conditions, only a handful of fallers, no serious stoppages, and some great racing. The fact that there were slightly more entries than the equivalent meeting a year ago, was an encouraging sign for 2019. With a number of former Club champions moving on or taking (temporary) retirement it was always going to be interesting to see who emerged as race winners and potential championship contenders, no more so than in the Paul Bland Motorsport Formula 600 class. Chris Eden and Chris Jones were 4th and 5th in 2018, and sure enough they were back on it, but this time securing 1st and 2nd places in the two races. James Chawke was a close third both times, and the best of the rest were Carl Jones, Eoin Collins and Rich Baker. The two Carl Roberts / Emjess Racing Powerbikes races saw to fantastic races with Jamie Coward, now a leading ‘roads’ campaigner, almost and Scotsman Scott Shand, comfortably out in front – Jamie won the first of the 8-lap races by 3/100ths of a second, but his victory in race 2 was somewhat more comfortable. James Chawke followed up his two thirds in the F600 class with two thirds in this bigger class also. Joey Taylor, having his best W100 meeting to date, and the experienced Graham Hornby were the best of the rest. In the Anglesey Senior Open Scott Shand was rewarded for his long trip south, and took the win from the F600’s of Chris Eden and Chris Jones. 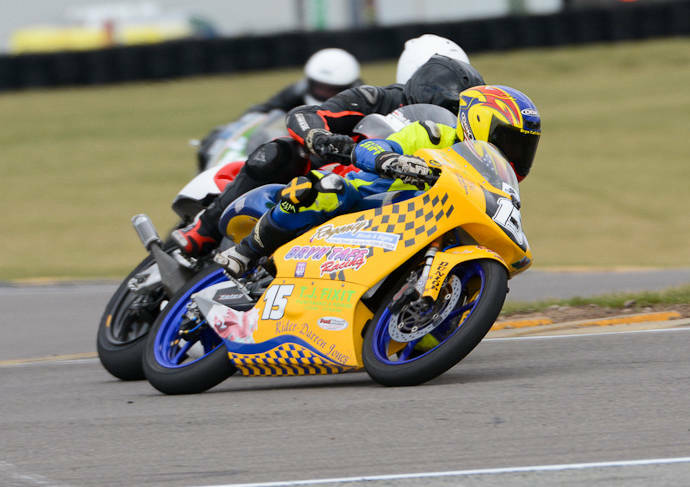 In the Pre-Electronics Powerbikes races, the returning Jon Wright had two very close wins over Adrian Kershaw, now on a 750 Kawasaki and giving his 400 a well-deserved rest. Just like the opening meeting last year the size and quality of the Open Sidecars entry attracted much attention. The 15 crews were generally having their first outings of the year and it was the younger teams, getting in some valuable track time ahead of their British championship series, who put on impressive performances in both races. Best of the lot were Sam & Adam Christie and Rob Biggs & Jeroen Schmitz, chased home by the Manx Crowes in race 1 and by Lewis Blackstock & Patrick Rosney in race 2. 650 Twins champion for the last two years, Mike Bampton, was one rider who continued from where he left off last year with two wins; there was no change also in his main threat: it again was Tim Sayers. 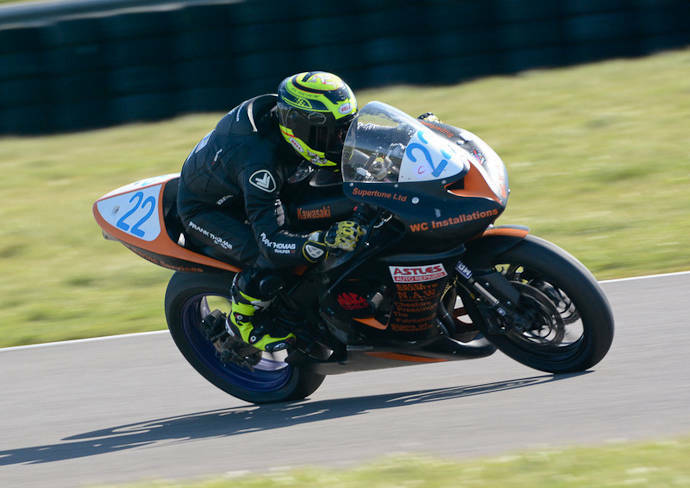 Max Dixon was a rider to emerge, however, with two 3rd places, and capped this off with his first W100 win in the Anglesey Lightweight Open. With Adrian Kershaw missing from the 100-500cc Allcomers races, it was Darren Jones, who was the favourite, but sadly he went out on the warm-up lap for race 1 with a broken chain (“Oh, bother”, he said); that enabled the returning Jamie O’Brien to take a narrow win from Ben Ashcroft with Andrew Jackson third. 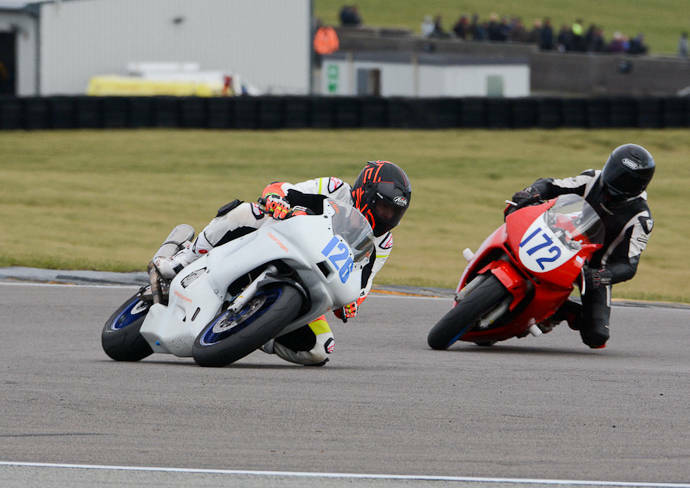 This order was repeated in race 2, except that Darren Jones had replaced his chain, and cleared off to win, despite starting the race from the rear of the grid. 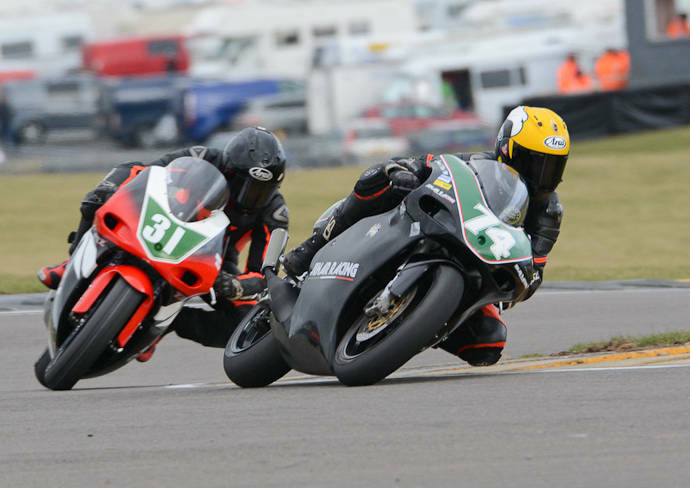 In the races designed for older machines, Simon Robins returned to W100 action in the Golden Era Supersport class after a few years away and took the two wins in the Golden Era Supersport class, albeit it that the existing club champion Tim Bradley was only 3/10ths behind in both races. Former champion Ray Stevenson was 3rd in race 1 but stopped in race 2, and this enabled James Leatham to take third. 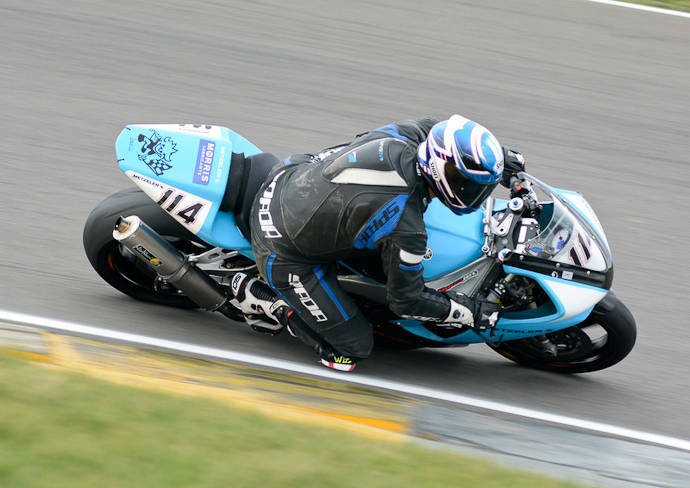 In the Pre-Injection races Jon Wright followed up his two wins in Pre-Electronic Powerbikes; the runner-up both times, and only a second away, was Greg Lewis, whilst Liam Evans claimed the two 3rd places. In the Forgotten Era races, with the 2018 unbeaten champion Paul Tye in the paddock spectating, Phil Millard took the opportunity with both hands and won both races fairly comfortably wins, whilst Stephen Kennedy and Ian Riley swapped the 2nd and 3rd places between them. 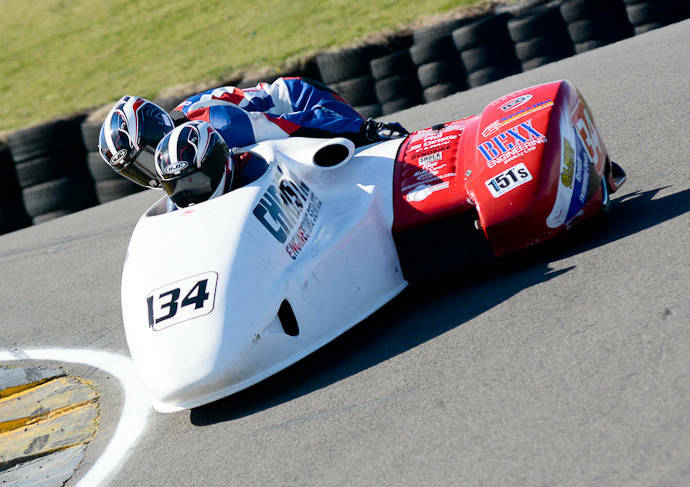 The W100’s next race meeting will be at Oulton Park on Saturday 27th April, when it will be catering for all of its usual classes, as well as hosting rounds of the GP Originals, Earlystocks and FSRA Pre-Injection Sidecar championships. This meeting will also feature the David Swallow Memorial Race for classic machines. Hero of Saturday night – the first responder Paramedic, camping overnight at the circuit, who dealt with the Irish gentleman, who had had a suspected heart attack. Heroes and heroines of Sunday – the marshals who all day cheerfully (!?) withstood the bitter winds – it will be a lot warmer at Oulton!